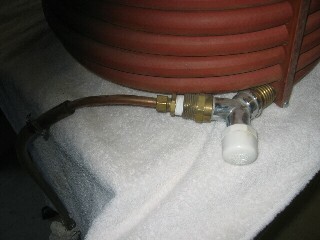 The Wort Chiller is used in the making of beer. Part of the process of making beer involves boiling the malted barley to extract sugars and other flavorings, as well as to extract the active ingredients from the hops, which act as a preservative for the finished product. Since beer wort is a high-sugar, low-acid substance, there are many micro-organisms which thrive in this environment. Almost all of them will spoil any batch of beer being made. As a result, once the boiling process is completed, the wort must be brought down to fermentation temperature as rapidly as possible to avoid or minimize the exposure of the wort to bacteria and fungi during its most vulnerable temperature range. 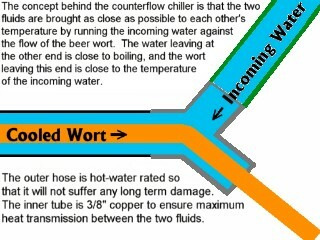 Commercially, this is almost always done with a counterflow wort chiller for three reasons. 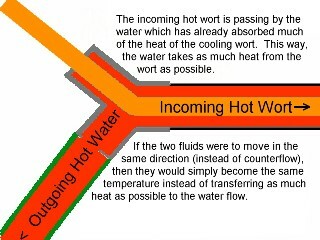 1) the wort can be kept inside a sterile environment (inside the inner copper tubing) during the cooling process, 2) by providing a source of temperature controlled water (chilled) the process can also precipitate out certain protiens which cause cloudiness in the finished beer, and 3) This avoids exposing hot wort to oxygen (which spoils the flavor and freshness. Home beer makers usually opt for an "immersion chiller" in which a spiral of coiled copper tubing is lowered into the hot wort and the excess heat is extracted this way. This is simpler and cheaper, but is not without risks of infection. However, since home-made beer is usually made in small batches, the cost of a lost batch is minimal compared to the risks for 1,000 to 10,000 gallon and larger batches made by commercial breweries. However, for purists who wish to maintain as close to "ideal" conditions as possible, the counterflow wort chiller is the way to go. In either case, the mechanism is the same: To pass cold water by the hot wort through the walls of a copper tube to act as a heat exchanger. The design of this model is an adaptation of one used by the University of California at Davis (UC Davis) in their brewing science program. 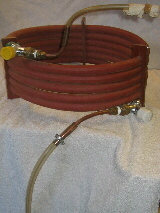 The chief difference is in the use of a hot-water rated hose for the outer tubing instead of both inner and outer tubes being made of copper. This was done to save money in fabrication. The "Y" components at each end are commonly available at most garden supply stores. If the brewer wishes to use larger tubing or hoses to accelerate the process, those materials are available, albeit at greater cost. The vertical "bars" surrounding the coiled chiller are support brackets made of garolite to clamp the hoses in place for neatness and stability. 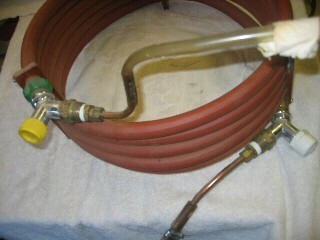 The yellow and white end caps cover hose fittings to be connected to a source of cold or chilled water during operation.